Outdoor garden rooms? Rooms? You mean with floors and ceilings and even curtains? Well, sure, why not! Say you start out with a small bed of flowers in your backyard. 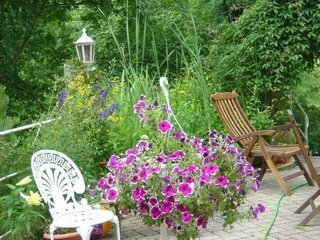 You set up a couple of chairs nearby to hang out and enjoy that flower bed. Next you add a small area for a fire pit so you can enjoy your garden in the evenings, too. Then you put up an arbor or Pergola for shade during the day on the weekends when you’re grilling sausages and hamburgers. You continue adding garden décor and accessories until … voilà … you have a fully furnished outdoor room. Floors could be earth or grass, decking or patio brick. Walls could be natural plants, trees, or shrubs, wood fencing or carpentry framed. The ceilings could be sky, a trellis, a thatched roof, or cedar shakes. Whatever your imagination can create. You can build backyard rooms for lounging or entertaining, or set up a private sanctuary or retreat. They can be small and cozy or quite large and inviting. Whatever you’re comfortable with, your only limitation is your own imagination and creativity. What do you want or need in the area? What can you afford as far as accessories and furnishings? Do you have a small space and are limited to only a few chairs around a fire pit or maybe one of the beautiful copper bowl fire pits? Or, do you have unlimited garden furniture space and would like to put in a large stone fireplace complete with built-in ledges for extra seating or additional potted plants? Do you want or need anything specific? Is an outdoor grill a must-have or maybe the floor of your outdoor room must be a particular type of brick. Instead of a full overhead pergola, you want a corner triangular shaped one or you like the sound of water so a fountain or pond is a must. Is your budget limited or do you have carte blanche? If you are limited, you may look for a colorful outdoor area rug to set under the wrought iron table on the deck instead taking out the deck and laying down the expensive patio bricks you like. If you have carte blanche, take a moment to imagine the possibilities … you may decide to purchase an entire wicker or Teak seating group to create an outdoor living room. You might even turn your room into an outdoor kitchen with a full service cooking center set under your cedar pergola where you enjoy grilling steaks and watching the sun set. Regardless of whether you live in the sunny south or the chilly north, outdoor garden rooms can become a part of the overall design for your garden areas. By considering your available space, your wants or needs, or what you can afford when it comes to accessories and furnishings, creating an outdoor garden room can offer you a personalied place for a little comfort … and maybe even, your own little garden paradise.